I’m not usually a “go out to breakfast” type of guy, but recently when I was in Lake Tahoe, going out to breakfast was really my only option. 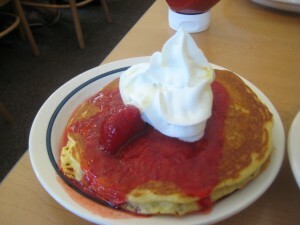 Rather than take my chances with a place I had never heard of, IHOP started calling my name, and I answered. The wait was kind of long, but I knew it would be worth it to get a hearty meal before spending the day hiking. 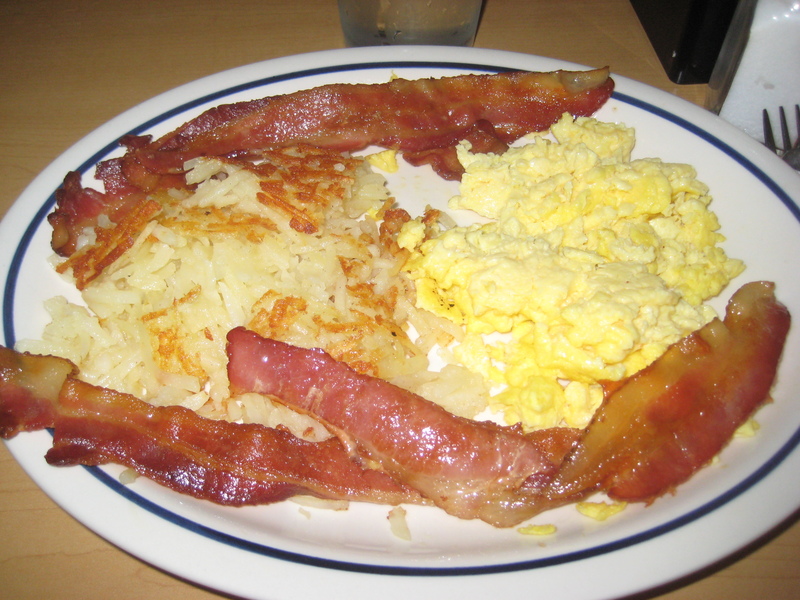 IHOP was having a special called Hawaiian Pancakes at the time, so my eyes immediately started checking them out. This wasn’t simply an order of pancakes though, the special also included bacon, hash browns and eggs. Amazingly, this special cost less than if I had just ordered eggs, hash browns and bacon (without the pancakes) so I knew it had to be mine. Of all the Hawaiian flavors, I decided to get the Strawberry Passion Fruit. The picture of it on the menu looked delicious, especially with the strange yellowish cream spilling out from between the two pancakes. My meal came out pretty rapidly and looked just as I had hoped. The lip of the dish containing the pancakes concealed the yellowish cream, but I knew it was in there somewhere. 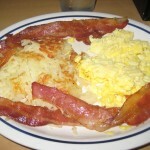 The bacon was decently crisp and the eggs were scrambled like I had asked. I tested out the pancakes and was pretty happy. They weren’t too sweet, as some specialty pancakes tend to be, but they were also distinctly fruity. Aside from the pancakes, nothing about the meal was too exemplary. It all tasted good enough, but didn’t exactly dance on my tongue. Nonetheless, it was a great way to jump start my metabolic system before a day of outdoor activities.